"To His Excellency William McKinley, President, and the Senate, of the United States of America. We, the undersigned, native Hawaiian citizens and residents of the District of Hamakua, Island of Hawaii, who are members of the Hawaiian Patriotic League of the Hawaiian Islands [Ahahui Hawaii Aloha Aina o ko Hawaii Paeaina], and others who are in sympathy with the said League, earnestly protest against the annexation of the said Hawaiian Islands to the said United States of America in any form or shape." Palapala Hoopii Kue Hoohuiaina, 1897. View and Download the Petitions Against Annexation from Hāmākua below! 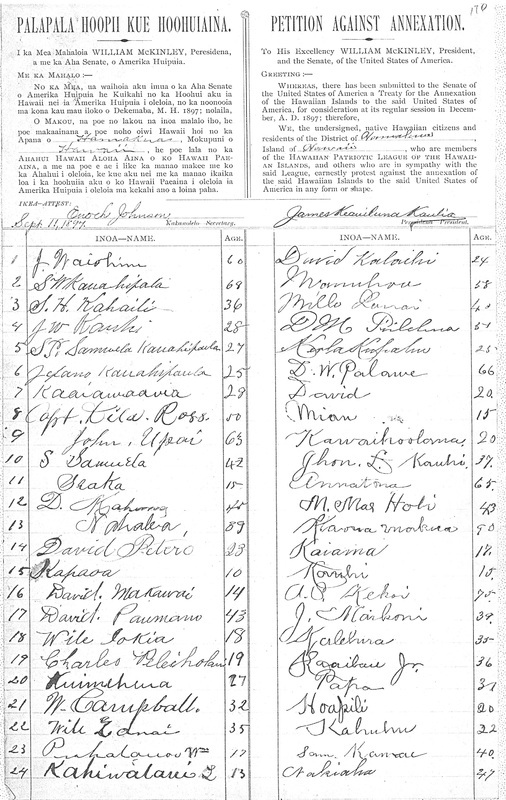 * For more info on the Kūʻē Petitions of 1897, and to see the petitions from the rest of Hawaiʻi, click HERE.